Producer Daniel Lanois is in intensive care after a recent motorcycle accident. Lanois is Neil Young's current producer for his next album. Respected Canadian producer-artist Daniel Lanois has canceled all upcoming tour dates after a motorcycle crash in L.A. this past Saturday, a press release announced today. 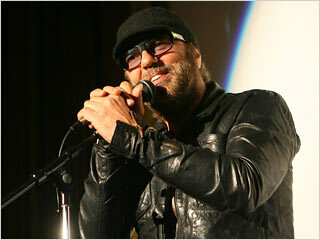 “Lanois suffered multiple injuries but is expected to be released from intensive care soon,” the release states. “Due to the severity of the injuries, Lanois…will be recuperating for the next two months.” He had previously scheduled a European tour for this July. Our sympathies and wishing Daniel a swift recovery. More on upcoming Daniel Lanois produced Neil Young album. 1st LA & now this ?! No wonder Neil's been grumpy lately. As a fellow motorcyclist I'd like to send Daniel good tidings for a fast recovery and I hope is injuries are not major. Ride safe people! Watch out for the other guy, because he ain't watching out for you! Wishing you well Daniel and a fast recovery. Black Dub... I kinda like that name... Studio One for ever! Thanks Mr Thrasher for putting the Gulf Oil Tracker on this site! I too am on the iron horse alot and know full well the dangers of the twisted road, which is to say basically that most the time the other driver ain't seeing ya or looking for ya. So be it carefull in your travels all you bikers. And Daniel, get well soon. Thanks for all the good wishes fellow Wheatsters! How'd y'all know I'd be looking in? Daniel - Hope you are feeling better,and getting betterer!! Great musician and producer - we need you - and Neil!! It's exciting to hear you will produce Neils' new effort. If you could get him to sing just ONE song in French, what a trip that would be. You rode into "The Lions' Den" and you made it out! You got a great name! Daniel, take care of you, man. See ya soon. All the best from france. if yes pls add fiddle and banjo!!!!!!!!! It's not TABERNAK! , it's TABARNAK! P.S. ; Producing while recovering is good for your health Dan. Glad to hear that Daniel is recovering. From a selfish point of view I guess this means a delay in the next Neil album. Just a thought but it might be a good time to release Toast. It would be appreciated by fans and allow Daniel time to recover and complete work on Twisted Road. Hope your feeling better Daniel, Take it easy.